This post presents a compilation of links to psychology papers; I have chosen papers I find intriguing particularly for working in class. All papers are open access (or a from open access repositories) which renders classroom work easier. The papers are collected from a broad range of topics but mostly with focus on general interest. The perspective is an applied one; I have not tried to select based on methodological rigor. 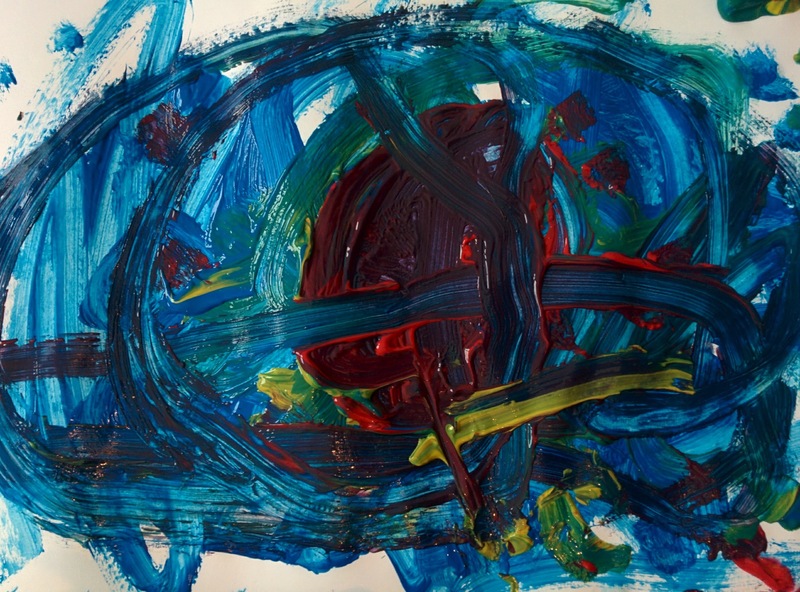 The collection is structured along the well-known classification of psychological work: social, personality, cognitive. I have added ‘social media/ psychoinformatics’ as this reflects a topic I am quite interested in. Behavioral Priming: It’s All in the Mind, but Whose Mind? Are women better than men at multi-tasking? 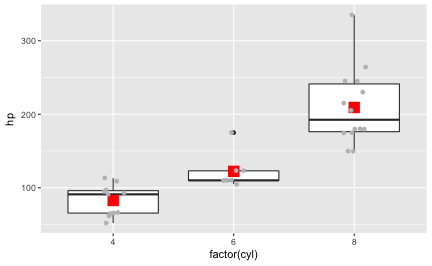 A convenient and well applicable visualization for comparing groups with respect to a metric variable is the boxplot. However, often, comparing means is accompanied by t-tests, ANOVAs, and friends. Such tests test the mean, not the median, and hence the boxplot is presenting the tested statistic. It would be better to align test and diagram. How can that be achieved using ggplot2? This posts demonstrates some possibilities. 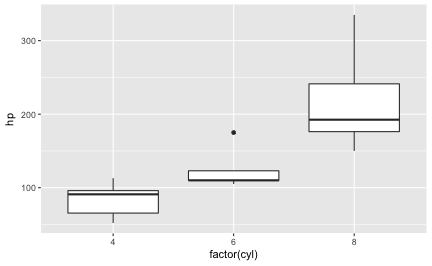 First, let’s plot a boxplot. Don’t forget to load the usual culprits. 2. Group this dataframe by column "cyl". 3. Summarise the column "hp" by using the "mean" function (applies to each group as defined in step 2). 4. Save the result as a new dataframe. One may say, just don’t run a t-test, do a Wilcoxon, and everything is fine. Agreed. Some say that the t-test has more power than the Wilcoxon, but I personally don’t think that is much of an issue. However, my goal is not to judge about which test “is better”, but just to show some ways of plotting raw (detail) data alongside with a summary statistic. Some say, the pipe (#tidyverse) makes analyses in R easier. I agree. This post demonstrates some examples. Let’s take the mtcars dataset as an example. Say, we would like to compute the correlation between gasoline consumption (mpg) and horsepower (hp). That’s ok, because cor expects a matrix or a dataframe as input. Alternatively, we can understand dataframes as lists as in the following example. the [[-operator extracts a column from a list (a dataframe is technically a list), and extracts it as a vector. This is useful as some functions, such as cor.test don’t digest dataframes, but want vectors as input (here x, y). We will use dplyr for demonstrating the pipe approach. If you are not acquainted with dplyr, the %>% operator can be translated as then do. More specifically, the result of the the lefthand side (lhs) is transferred as input to the righthand side (rhs). The function do from dplyr runs any function, provided it spits a dataframe. That’s why we first apply tidy from broom, and run do afterwards. The . dot refers to the dataframe as handed over from the last step. We need this piece because cor.test does not know any variable by the name mpg (unless you have attached mtcars beforehands). Why is it useful? Let’s spell out the code above in more detail. Line 3: “Tidy the result up. Not necessary here but quite nice”. Remember that cor.test does not accept a dataframe as input. It expects two vectors. That’s why we need to transform the dataframe mtcars to a bundle of vectors (ie., the columns). In sum, I think the pipe makes life easier. Of course, one needs to get used to it. But after a while, it’s much simpler than working with deeply nested [ brackets.